As the first modern novel, Miguel de Cervantes' famous story influences European literature and art in countless ways. Like the Arabian classic, "A Thousand and One Nights," the Spanish text has so much to offer that adaptations appear to be entirely different stories. For example, the popular Broadway musical The Man of La Mancha and the classical ballet Don Quixote, Colorado Ballet's current production. The ballet's libretto was conceived by the great choreographer Marius Petipa and set to Ludwig Minkus' score. 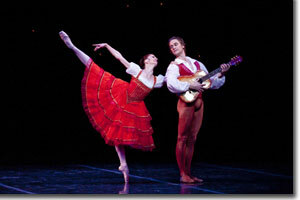 Petipa wisely chose to focus on the love story of Kitri and Basilio. The girl's father doesn't want them to marry because the boy isn't rich. 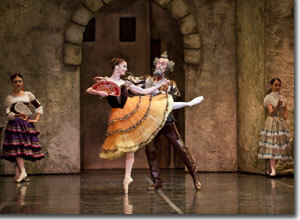 Don Quixote helps the lovers get the girl's father's blessing. The love story supports a wonderful series of pas de deux and folk dances wrapped in romantic interludes, jealous fits, and Quixote's grand imaginings, chivalrous excesses, and gallant quest. On opening night, Maria Mosina and Igor Vassine exhibited their prodigious artistry as the lovers, captivating us with the first blossoms of love in the opening scene, Mosina as the coquettish Kitri and Vassine as the serenading guitarist, then carrying us along on their adventure as they attempt to elope. Their duets and solos offer a little of everything, from Mosina's feverish and fetching castanet-inspired rapture to Vassine's powerful leaps and impressive lifts that seem to last a lifetime. A parallel series of sensual duets between Mercedes (Sayaka Karasugi) and Espada (Dmitry Trubchanov) light up the stage. Don Quixote (Kevin Aydelotte) tilts with windmills, Sancho Panza (Joey Wishnia), despite himself, keeps the old knight errant out of harm's way. Gregory Gonzales' foppish Gamache is a comedic gem. And, of course, there are gypsies to heighten the romantic atmosphere. Minkus' score evokes rich cultural melodies and supports a non-stop series of dances, all of which sparkle under the baton of Adam Flatt. 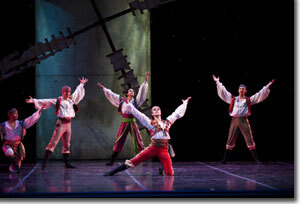 Don Quixote runs through October 25th at the Ellie Caulkins Opera House in the Denver Center for the Performing Arts. 303-837-8888 or www.coloradoballet.com.